Could China’s home-grown answer to Uber be worth as much as the original? Twin taxi-hailing apps, Didi Dache and Kuadi Dache, could already be worth almost $14 billion – twice their reported value when they merged in February. They could even close in on the $40 billion valuation of the U.S. app that started the whole craze. All depends on how much passengers are willing to pay for something they now get free. Valuing an app with no apparent revenue isn’t easy, but that’s exactly what early investors such as SoftBank have had to do. Didi and Kuaidi’s numbers aren’t public; the combined company has declined to comment. Unlike Uber, which recently entered China, Didi and Kuadi rely on traditional taxis. But with 99 percent of the fledgling taxi app market, there is much to aim for. China recorded over 40 billion taxi rides in 2013. Didi and Kuaidi’s worth depends on three things. First, the number of rides booked via an app – say it could reach 10 percent of the total, or 4 billion. Then there’s the amount customers might pay to lure a cab right to their door. A $1 booking fee would be a quarter of what Uber charges Hong Kongers for a cab at peak hours. Finally, there’s the driver’s cut. 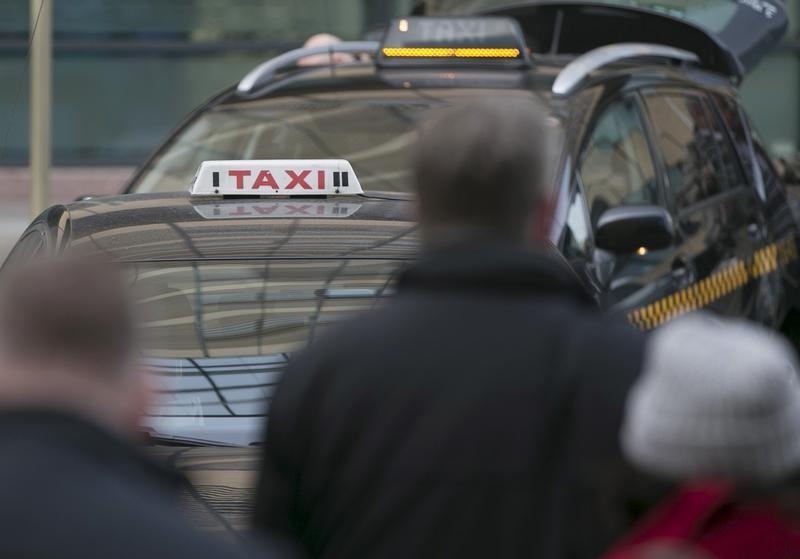 That will have to be negotiated, but it’s conceivable that cabbies, who currently get bonuses for every journey, might demand a minimum of $0.50 per ride, or 75 percent of the fee beyond that. This scenario could add up to $1 billion a year in revenue for the apps. Apply a 50 percent operating margin – roughly what backer and Chinese e-commerce operator Alibaba Group reports – and China’s 10 percent tech-sector tax rate, and the two apps could generate $450 million in earnings a year. On the same valuation multiple investors give to China’s biggest internet companies, Didi and Kuadi could be worth $13.6 billion. Shift the gears just slightly, and China’s taxi apps could catch up with Uber itself. Charging $1.50 per passenger and bagging 20 percent of all rides suggests a valuation of $41 billion. But there’s a really big caveat. Right now, passengers pay nothing for the extra service – and even get freebies. As long as that lasts, there may be no valuation worth speaking of. What’s needed next is a plan to drive revenue without driving customers clean away. Customers wait for taxis outside a railway station in central Brussels March 24, 2015. Didi Dache and Kuadi Dache, China’s leading taxi-hailing apps, merged in February this year. The combined entity is valued roughly at $6 billion, Reuters reported. Didi Dache and Kuaidi Dache are backed by social media and gaming group Tencent and e-commerce company Alibaba respectively, though their stakes are not publicly disclosed. The two taxi apps have a combined market share of 99.8 percent as of December last year, according to China’s state newswire Xinhua. Together the two apps paid out some 2.4 billion yuan ($390 million) in subsidies – mostly tips to drivers and fare cuts for passengers – in the first six months of 2014 alone, according to Xinhua.